We were a day in Pua and stopped a few km out of Pua along route 1081 at this Coffee Shop build in / on the rice-fields. 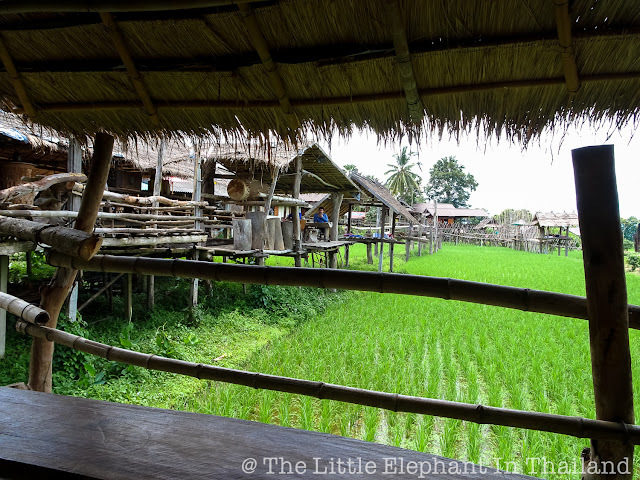 Made with wood & bamboo are little sala's, all connected with wooden walking bridges over the rice-paddies. In the sala's are no chairs or tables, just traditional Thai pillows to sit and relax while enjoying a drink. Along the road itself is also an shop selling traditional Tai Lue cloths. For more information about the beautiful Nan province in North Thailand see Destination Travel Guide Nan - Thailand.